Monte Belmonte could have been an Olympic speed walker if he hadn’t become one of the Valley’s most recognizable radio personalities. Or at least that’s how it feels as I huff and puff trying to keep up with him. 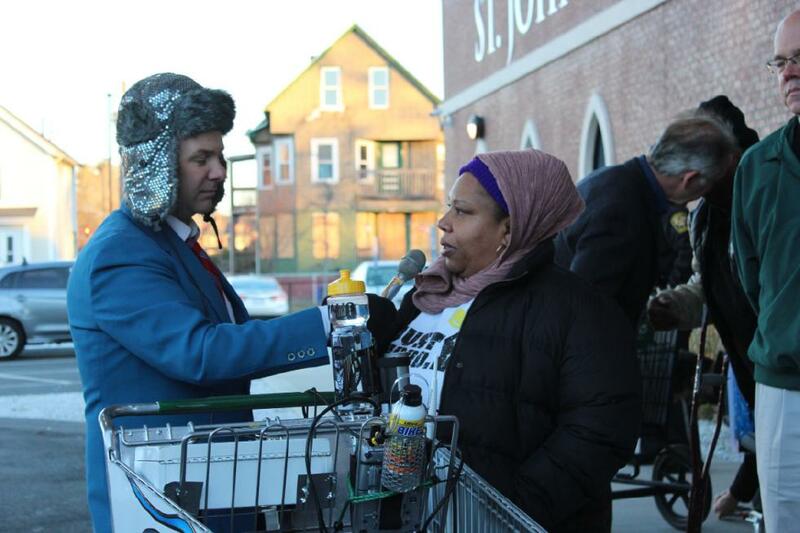 Dressed in his cerulean blue suit — complete with his red striped tie and Catcher in the Rye hat — Monte is pushing a shopping cart full of radio equipment as he does his show live from Route 5 at a clip. But it’s not a full bladder that pushes Monte on — he just took a bathroom break at Gateway City Arts in Holyoke — it’s a passion to turn hunger into a non-issue. For the last five years Monte has been hosting Monte’s March, a walk-a-thon that raises money for the Food Bank of Western Massachusetts and draws attention to hunger and malnutrition. Massachusetts ranks third-worst in a national food access poll, according to The Food Trust, a Philadelphia-based firm dedicated to improving food access. Per capita, several cities in the commonwealth — including Springfield — have 30 percent fewer supermarkets than the national average. The situation is particularly bad in Western Mass, where public transportation is less widely accessible than in Eastern Mass. According to the Food Bank of Western Massachusetts, 235,000 people in Western Massachusetts face hunger. Many, activists say, also suffer from malnutrition fueled by a geographical lack of access to healthy foods, or areas categorized as food deserts. Up until this year, Monte’s March — a 24-mile walk from Northampton to Amherst to Greenfield — focused on hunger issues in Hampshire and Franklin counties. The walk usually attracts dozens of marchers and raises about $50,000-$60,000. But after he connected with the Mason Square Food Justice Initiative, Monte expanded the 2015 march to include 17 miles that incorporate Springfield. Springfield was a natural addition to the march because of the city’s struggle against food insecurity. 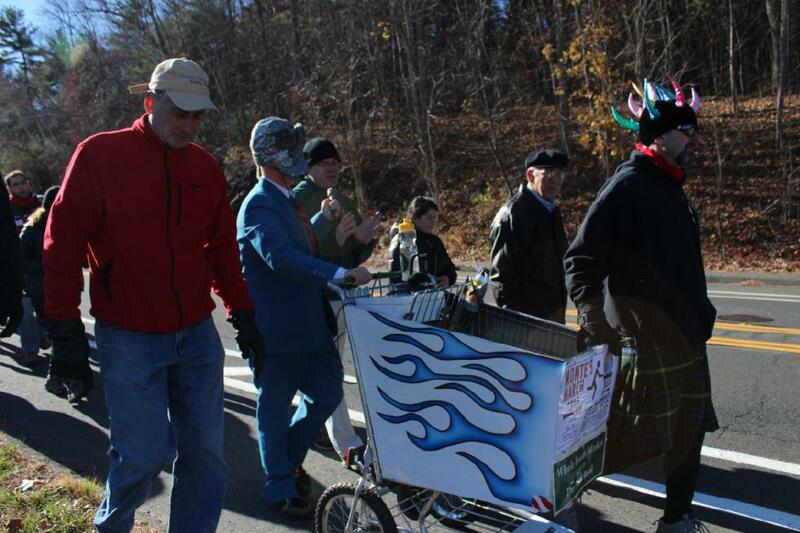 With the added miles and representation, this year’s march, which was Nov. 23-24, raised over $150,000 for the Food Bank of Western Massachusetts. The work being done to improve nutritional access includes gardening and cooking classes, farmers markets, school nutrition improvements, and surveys that can help convince full-line supermarkets to move into neighborhoods that need them. Wills-O’Gilvie chairs the Springfield Food Policy Council, Gardening the Community, and serves as Project Advisor to the Massachusetts State Food System Plan. She also teaches gardening in Springfield schools in order to empower kids to grow fruits and vegetables for themselves. “Seeing the kids working in the gardens — it makes people think,” says Wills-O’Gilvie. “It’s infectious. It’s not people looking for a handout. It’s people thinking, how can I do this myself?” Indian Orchard’s John F. Kennedy Middle School’s garden has grown so large as a result of the instruction, it’s been able to provide enough greens to serve as part of the school’s lunches. Kiah McAndrew — program director of Mass in Motion, a Springfield health and human services program — says her department has been working with the Springfield Food Policy Council’s School Nutrition Committee on school lunches and breakfasts. Sodexo, a company that provides cafeteria food to Springfield schools, made changes to their service based on this work. Wills-O’Gilvie, who lives in the Mason Square neighborhood and is familiar with the needs of her community, says that for many children the breakfasts and lunches they get at school are the only healthy meals they get. “For these kids,” says Wills-O’Gilvie, “these meals really need to count.” She adds that her neighbors aren’t sitting around and waiting for someone to come and help them — they’re working low-paying jobs, trying to find jobs in a high-unemployment city, and trying to figure out ways to develop their community. Their passion is leading to grassroots movements like Gardening the Community — an urban agriculture nonprofit devoted to creating abundance and fighting food inequity. During the summer, volunteers — including kids and teens — haul food they’ve grown on lots throughout Springfield to their farm members. Their active CSA serves 66 families in Springfield, in addition to the dozens of staff, volunteers, and their families. Sitting at a round table in the State Street building that houses Partners for a Healthier Community, Kathy Wicks of PHC, Wills-O’Gilvie, and McAndrew say it’s challenging to convince gas stations and corner stores to provide healthier options because store owners don’t believe that’s what will sell. “There’s an assumption about what we’ll choose,” says Wills-O’Gilvie. McAndrew says a recent Health and Human Services study shows that 92 percent of Springfield residents would purchase healthy grab-and-go options, provided the opportunity. Heading into last Monday’s Monte’s March, I’m totally overconfident in my abilities. The driver of The River’s colorful vehicle rides slowly behind me and the driver looks at me questioningly as I fight the urge to hop in his passenger seat. Ahead of me, eight-year-old Finn Torrey is experimenting with side-walking as a way to provide some quad relief. I follow his lead. It works for a minute but then those muscles quickly wear out. We switch to a gallop as we reach the Easthampton town line. I gallop my way towards the front to get a closer glimpse of the upcoming Northampton line. The Northampton sign is taking way too long to show up, and I start feeling downtrodden. I think about the smoothie and the hearty meal I’m going to treat myself to, and I start dwelling on the pain in my feet and how long it’s taking to get to home. But then I start thinking about all I’ve learned in covering food insecurity in the Valley over the past month — all the work being done and all the people in the Valley who are doing way more for themselves with far less — and I realize that sounds a lot like privilege.